The excitement over the Expo 2020 host city announcement is growing. Just over a month until the representatives from the 167 member nations of the Paris-based Bureau International des Expositions (BIE) cast their votes. We will know on November 27th if our amazing city is the official host of the World Expo, one of the most internationally renowned global exhibitions. As you know, four cities have bid for the world's fair in 2020: Dubai, UAE / Ekaterinburg, Russia / Izmir, Turkey / Sao Paulo, Brazil. No matter the winer, it will be a first in the history of the World Expo. If Dubai or Izmir win, it will be the first Middle Eastern expo, or it can be the first Russian world's fair if Ekaterinburg wins or Sao Paulo victory would make it the first world's fair in South America. It's all very exciting. Have you seen "Ali’s Film"? It's a less then 5 minutes recap on Dubai and the expo 2020 through the eyes of 10 year old Emirati schoolboy Ali. 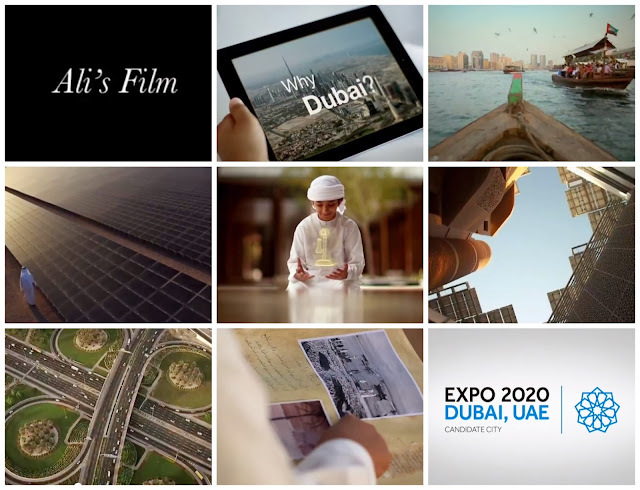 He talks about ‘the greatest city in the world’, shows us some of the UAE’s most iconic landmarks, and answers the questions ‘Why Dubai?’ The video was produce has a boost to support the bid to host the expo. What do you think? Dubai is said to be a favorite in the nominees. Under the theme of "connecting minds, creating the future," Dubai aims to be winning city host. The proposed venue for the World Expo is located in Dubai World Central's exhibition district (Dubai Trade Centre - Jebel Ali) close to the Al Maktoum International Airport but also DWC's surrounding amenities and facilities to come. As a Dubai resident, a guest of many years, I wish Dubai the best of luck and sincerely hope it will be the winning city. I hope it will be a victory used wisely and a great event to showcases spectacular exhibitions, pavilions and cultural events by international organizations, businesses and nations from around the world. It's an opportunity to do something great and raise awareness toward many issues like sustainable development, global economy and the quality of life and so much more! Go Dubai!